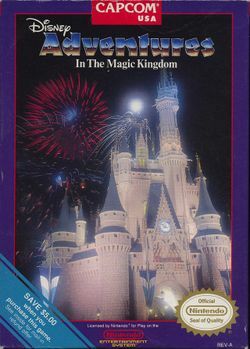 Adventures in the Magic Kingdom is a video game released in 1990 for the NES. Its soundtrack was composed by Yoko Shimomura who later scored the Kingdom Hearts series. The game places you as a nameless main character. Goofy left the golden key for the castle gate inside, and Mickey Mouse asks for the player's help to find six silver keys needed to open the Cinderella Castle gate and allow the Disney parade to begin. After completing this task, Mickey congratulates the player and the parade begins. This page was last edited on 29 May 2014, at 17:52.